We’d love your help. Let us know what’s wrong with this preview of Skyborn by David Dalglish. The lives of their parents claimed The first in an all new fantasy series from USA Today bestseller, David Dalglish. To ask other readers questions about Skyborn, please sign up. Is this a stand alone series, or do I need to read the Shadowdance series first? David Dalglish It's stand alone, completely separate from Shadowdance or any of my other series. Is this a spinoff of his Shadowdance books, or somehow related to them? A Random No. It is completely standalone. Look at me. This is my stunned face. As in, I could not believe how good this book turned out. Granted, the story was a little slow to take off (sorry, unavoidable pun), but the momentum gradually built up so that everything culminated into one of the most incredible and jaw-droppingly explosive endings I’ve ever read. In fact, if I had to rate this book based on just its second half alone, it would have been an easy 5 stars. But the first half, despite not having the same level of excitement and energy of the second half, was no slouch either. In the first two hundred pages or so, David Dalglish made sure we got plenty of time to familiarize ourselves with the fascinating world of Skyborn. We also got to know our two protagonists, twins Bree and Kael. Readers take to the skies in this opening to a new series set in a richly imaginative world. Hundreds of years have passed since a disaster wiped out much of humanity, and survivors have established a new society on six floating island kingdoms which are constantly warring with each other. Aerial battles are fought by Seraphim, elite winged soldiers who command the powers of the elements. The story begins with one such conflict. Bree and Kael’s Seraphim parents are subsequently killed by soldiers from a rival island, but instead of turning away from a life of war, the twins become even more drawn to it. It is their dream to become Seraphim themselves, and at age sixteen, after finding out their elemental attunements, both siblings are accepted into the Seraphim Academy where they will learn how to fight using weapons powered by elemental crystals and fly wearing specialized wings. But something smelled fishy right from the start. Both Bree and Kael’s attunement tests led to strange results, arousing my suspicion that someone is going to great lengths to make sure the twins become Seraphim. But who would want to push them towards this fate? And why? It’s an irresistible mystery that sticks around for rest of the book, a teasing thread that kept my interest piqued even between all the breathtaking airborne skirmishes and elemental duels. The book started off slow for me, but if you enjoy academy settings and training school tropes, perhaps you may take to the intro with more ease and speed. This part of the story was rather typical, following the twins as they get settled into their new lives as Seraphim cadets. Bree and Kael are assigned their classes where they make new friends and enemies, and there’s even some romance involved as both siblings meet their respective love interests. Indeed, I sense the potential for strong YA crossover appeal…but with a wicked edge. Despite the familiar take on “magic school” themes, there are unpredictable plot elements in here that I never would’ve seen coming in a million years–including several dark twists and a couple violent and/or graphic scenes that would make this book less suited for younger audiences. No matter who you are though, I think you’ll love the twins. The two of them are as different from each other as their attuned elements; hot-headed and impulsive Bree is a prodigy at flying but she’s nonetheless helpless when it comes to controlling her fire, while even-tempered Kael is more balanced in his studies and adept at drawing on his ice affinity. Bree’s brashness might make you feel torn between wanting to throttle her and wanting cheer her on, but it’s clear she takes no crap from anyone, and there’s also no denying she has some of the best scenes. However, Kael is also able to hold his own, balancing his sister’s bold personality with his clear thinking and more inquisitive mind. As dynamic sibling duos go, they make one hell of a team. As events of the novel ramp up and relations between the islands continue to deteriorate, the plot also becomes increasingly edgy and suspenseful. Around halfway through the book, something huge and unexpected happens, turning one of the twins’ world upside down. The story took off like a rocket at this point. Unfortunately for me, I was reading Skyborn at night and reached this part right before bedtime. Good bye, sleep! From here on out, this book was impossible to put down. And after I was done, it was another couple of hours before my mind could calm down from that nail-biting, heart-dropping-into-the-pit-of-my-stomach conclusion. I’m tentatively rating this book 4.5 out of 5 stars for now, but I suspect as time goes by my love for it will only grow. Days after I finished, the heart-pounding aerial sequences are still playing out over and over in my head, and the euphoria from reading this book is not likely to fade away any time soon. These feelings are a bit of a surprise, but I sure wish more novels would shake up my expectations the way this one did. I feel like I just fought 100 battles myself. This book has all those things so it has definitely become one of my favourites of the year. Okay so that last one is specific to this book because I can't think of any other books with sky cities in them but hey it definitely makes that list now. I was enthralled from the beginning and it kept my interest all the way through. I found it very easy to read, like I didn't think it was really dense writing like some fantasies can be and that definitely helped keep me intrigued. The characters were cool and likeable, and there were times when they were sad that I actually wanted to go and hug them haha. Bree is your badass (and sometimes reckless) female character, but she isn't cold hearted and feels a lot of guilt for stuff that happens. Kael is the quieter, more level headed and more adorable one that I would love to be friends with, and he is very loyal to his sister. The POVs switch which I like a lot. There were some great side characters too. The flying and elemental magic combination made for some unique and destructive fight scenes. The only thing I would've liked more about that is if the elements were able to be used together somehow. This review has been hidden because it contains spoilers. To view it, click here. Well, now, now, that's one hell of an original story. Theotechs, winged flyers, elements command, conspiracies and subterfuge, sky battles and earthly studies, all this makes for a very original world. Uh-huh, a really nice mix of genres and larger than life characters. I loved it and I'll have too look up the next book in this series to know what will further happen. “Stand up straight, smile wide, and pretend you belong,” Dean said as they reached the end of the hallway. “A Well, now, now, that's one hell of an original story. Bree did just that, standing up straight, pulling back her shoulders, and smiling as if the Willer mansion was the most amazing thing she’d ever seen. “What happens if you don’t have a message to deliver?” Kael asked. “Why go if there’s no message?” Kael asked. I really enjoyed this... highly recommended! Full review to come. It took me a little while to get into this, but once I did I was hooked! The writing style is accessible, the characters are likable, and I really liked the seeds sown towards the end about where the series is headed. Perhaps most of all, I really liked the relationship between the two main characters (twins) and their friends. It reminded me a lot of the friendship I have with my brother! They're supportive of each other, and when they have disagreements they actually TALK TO EACH OTHER about i It took me a little while to get into this, but once I did I was hooked! The writing style is accessible, the characters are likable, and I really liked the seeds sown towards the end about where the series is headed. Breanna and Kael have yet to take their test at Center. The test is to discover if they have the skill needed to become Seraphim, like their parents. Seraphim are soldiers for the floating islands. Theotechs from the center island create/make the prisms needed to fly as well as the elemental prisms Seraphim use to fight with. Despite the horror of their parents’ death, Breanna has always known she was meant for the air. A friend of their parents, a Seraphim from Center, convinces their aunt that Breanna and Kael have yet to take their test at Center. The test is to discover if they have the skill needed to become Seraphim, like their parents. Seraphim are soldiers for the floating islands. Theotechs from the center island create/make the prisms needed to fly as well as the elemental prisms Seraphim use to fight with. Despite the horror of their parents’ death, Breanna has always known she was meant for the air. A friend of their parents, a Seraphim from Center, convinces their aunt that it is time for their tests. Showing elemental skill the two are sent to the Academy where events build until a war between islands starts to brew. Skyborn is the first novel in Dalglish’s Seraphim series. It’s also the first book I’ve read by Dalglish, but won’t be my last. The story unfolds in both Breanna and Keal’s POV. I felt much more attached to Breanna. The novel is a lot like those epic fantasy stories we read as teens, which reminds me—I can’t figure out why this wasn’t labeled YA. Both characters are sixteen and training to be warriors for their island gaining skills that might put them on the path to saving their island(s). The majority of the book takes place at the academy as Breanna and Keal learn to be Seraphims. Breanna is the best flyer in the class but can’t figure out her element (fire) while Keal isn’t the best at anything, nor is he the worst at anything. He catches the eye of his island’s princess and confronts bullies, which isn’t a very strong story line in comparison to Breanna. Breanna learns swordsmanship from an older student at the academy and the two fall in love with one another until he decides to duel a man at another academy. Politics are brewing in the background. There is a man labeled a heretic who preaches against Center and its Theotechs. He believes the Throtechs, who keep the islands afloat and the elemental prisms working, are lying to the people. Is Center using them and pitting them against each other to control the population? Breanna and Keal start to notice that Center is watching them closely, slowly they start to wonder why. I enjoyed the world of Skyborn. While it might sound complicated, it isn’t. It’s an easy read and enjoyable story about twins who I hope are on their way to saving the floating islands. I look forward for the next novel, Fireborn. My only reservation is that this should have been labeled YA. I think it’s a story both adults and teens would enjoy together. *On another note. I’m a little confused with the cover art of Skyborn (not that it’s bad, I just don’t think it fits.) I mean the story is about floating islands, throwing around fire and ice, and fighting while flying through the air. The main characters are sixteen years old. I think this is supposed to be Kael, but Kael is skinny and as I’ve said before, sixteen. Then I thought maybe it was their father, Breanna’s boyfriend, or Keal’s roommate. I still don’t know, but FLOATING ISLANDS!! SKY FIGHTS!!!! TEENS!!! Why does it picture none of these things? The image isn’t bad, only the novel gave it the opportunity to be more. Skyborn was not my cup of tea. It has some interesting concepts but I found the characters flat and difficult to connect to. The story kicks off with a battle between Seraphim: aerial soldiers who utilise mechanical wings to fly and fight with elemental energy stored in prisms. It's an action-packed beginning, but one that struggles under the weight of all the worldbuilding jammed into it. The stakes are hig Disclaimer: I was provided with a free copy of this book in exchange for an honest review. The story kicks off with a battle between Seraphim: aerial soldiers who utilise mechanical wings to fly and fight with elemental energy stored in prisms. It's an action-packed beginning, but one that struggles under the weight of all the worldbuilding jammed into it. The stakes are high for Breanna and Kael, whose parents serve in the defending army. However, those stakes might as well not exist for the reader, who doesn't get to meet the older Skyborns until Breanna's mother dies in her arms. Without any kind of emotional connection, the sequence reads as a series of tropes solely designed to deliver information about the world. Perhaps I am being too harsh, because it does serve as a nice introduction to Breanna and Kael. Despite being told to stay with their aunt, Breanna sneaks out to watch the battle. While she dangles her legs off the edge of their floating island home, Kael sits back at safer distance. Inevitably, Breanna's recklessness gets them caught up in the battle and she doesn't endear herself by abandoning her brother when he, frightened, takes shelter. The symbolism in the book isn't exactly subtle. For example, the Skyborns grow up in Lowville, a community of earth-bound farmers and fishermen on graceless wings. When tested for their affinity to the elements, reckless Breanna shows a strong connection with fire while cautious Kael ends up with ice and light. I found the relationship between the twins was the most interesting aspect of the story. Alternating chapters (from a close third-person point-of-view) allow us to see things from the perspective of both Breanna and Kael. This slowed down the pace of the story because it meant developing two protagonists instead of one; the twins might attend the academy together but their lives are, for the most part, fairly independent of each other. I liked this. It meant that there was always one twin to take the place of the rising star at the academy--and it changed as the story progressed. Best of all, neither of the twins was resentful of their sibling in the limelight. They may sulk a little or have their own worries to contend with, but they were never hateful and their relationship always remained supportive (with the plot-driven exception of the prologue). As I mentioned, the pace is slow at first but picks up a bit past halfway, once the world and characters have been established. My interest picked up a little with the pace, but I often found myself skimming through paragraphs of description. On the whole, Skyborn is a readable story but not an especially engaging one. I really liked this 1st instalment of a new fantasy epic however I felt it suffered from following the current YA trend of being set in the future, teens being trained up to fight, lots of romance and teenage angst, before the big fight to the death at the end. Also, perhaps I am being old and hard hearted but the twins did seem to spend a lot of time crying and brooding. I know they have a lot of problems but come on, Get a Grip!!! Despite all this the story and setting save the book. What remains of mankind now live on islands floating above the ocean and are overseen by Control. Each island are protected by Seraphim, soldiers who have mechanical wings and can fire lightening, rocks, ice and fire. While there is a big section where our heroes are trained to be Seraphim, where there is romance, friendships and enemies made there is an underlying conspiracy storyline to keep things interesting. Oh what the hell.... I am giving it 4 stars. Alright, I had actually forgotten to write a review about this book, which says a lot. Usually, even if I disliked a book, I have some things to say but to be honest it's not really the case here. I had been drawn by the thrilling summary and beautiful cover, but I was left really disappointed. Overall, it's not a bad book, of course, but I just found it really long and dull, and I struggled to finish it. The world-building may be the best thing about it, and the story is quite interesting in gen Alright, I had actually forgotten to write a review about this book, which says a lot. The world-building may be the best thing about it, and the story is quite interesting in general. It's rather a problem in the realization to me. The pace is EXTREMELY slow, which could be a good thing to introduce the universe of the series; but to me it was so hard to get a grip on it. The training of the Seraphim which I was so eager to see just bore me to death after endless chapters of reading about every single detail of their lives. On one hand it felt like a big info dump at times, with lots of characters and places and details, and on the other it felt like it lacked something. Maybe more emotion, more "foundation"? I don't know, it's just a feeling I can't explain. A bit too much Young Adult (YA) for my taste. It actually felt a bit like Harry Potter at the Academy. Especially with the flight training. No good connection or feeling for the characters. Good story but very light. I'm not sure I will read the other two books in this series. In a world where all that's left of humanity lives on six islands floating in the sky, wars are fought in the air by the Seraphim, elite soldiers donning mechanical wings and wielding elemental powers and blades alike. Twins Breanna and Kael Skyborn enter the Academy to join them and do their part in the ongoing civil war between the islands that claimed the lives of their parents years ago. While they learn to fly and control their elements, however, the twins also hear whispers of things that In a world where all that's left of humanity lives on six islands floating in the sky, wars are fought in the air by the Seraphim, elite soldiers donning mechanical wings and wielding elemental powers and blades alike. Twins Breanna and Kael Skyborn enter the Academy to join them and do their part in the ongoing civil war between the islands that claimed the lives of their parents years ago. While they learn to fly and control their elements, however, the twins also hear whispers of things that might prove dangerous to know: Uncomfortable facts about the balance of power between the islands, and rumours of rebellion against the theocracy keeping everyone under their thumb. Whatever the truth behind these conspiracy theories, one thing is for certain: the war is ramping up and Bree and Kael will find themselves on its frontlines sooner rather than later, fighting for their lives with all they've got. I picked this up on a whim at the bookstore recently mostly because I liked the cover. I know, that seems very shallow of me, but the cover is really awesome! I’ve also got a fondness for winged people/creatures and though this wasn’t quite what I was expecting it still satisfied me. Humans now live on floating islands that lie high above an endless ocean and are bathed in the light of sky fires at night. It sounds beautiful, though harsh and the humans have adapted to this new world by using me I picked this up on a whim at the bookstore recently mostly because I liked the cover. I know, that seems very shallow of me, but the cover is really awesome! I’ve also got a fondness for winged people/creatures and though this wasn’t quite what I was expecting it still satisfied me. Humans now live on floating islands that lie high above an endless ocean and are bathed in the light of sky fires at night. It sounds beautiful, though harsh and the humans have adapted to this new world by using mechanical wings powered by crystals. Note that only the warriors and fishermen use these wings- the crystals are a pricey commodity controlled by the Center island. I like the story and characters well enough, though the story itself lacked something to really draw me in. I can’t say what exactly because it contained everything that I usually love in stories- a unique society, magic-type powers, a love interest, and intrigue. I just wasn’t CRAZY about it. I will say that if it sound like it’s your kind of story, then go for it! It was quite good, but didn’t leave a lasting emotional impact on me. I may eventually read the second novel, Fireborn, just to see what happens. No star rating - didn't finish. I got a third or so into this book and decided it wasn't the right fit for me. I wanted to like it (which is why I kept going even a third through) because the themes and characters and world seemed really, really cool. Unfortunately something about the actual craft of the writing rubbed me the wrong way. I kept finding clunky sentences that jumped out to my writer-self and screamed "This could be worded better!" I think the issue was it's so similar to my own styl No star rating - didn't finish. I enjoyed this book with its interesting premise and new take on magic. To be fair I did struggle to continue reading at first (hence the 4 stars) but as the book progressed and the story became less set up and more about the characters it drew me in to find out what happened next. I would definitely recommend it to anyone looking for a fantasy novel with a difference. The first 3/4 of book deserves 3 stars, and the last 1/4 would get 4-4.5 stars. As excited as I was to finally try it out, Skyborn wasn't what I hyped it up to be. Much like other's reviews on here, the world itself is well thought out, and I'm interested in learning more about how the floating islands came to be, as well as the intrigue behind the crystals, wings, and ruling system. But even these things bugged a bit though the whole book until towards the end when we start to get a glimpse tha The first 3/4 of book deserves 3 stars, and the last 1/4 would get 4-4.5 stars. As excited as I was to finally try it out, Skyborn wasn't what I hyped it up to be. Much like other's reviews on here, the world itself is well thought out, and I'm interested in learning more about how the floating islands came to be, as well as the intrigue behind the crystals, wings, and ruling system. But even these things bugged a bit though the whole book until towards the end when we start to get a glimpse that Center might not be as helpful as everyone thought, and that there might be an underlying reason to all of it. Prior to that, I couldn't figure out why the last 4 islands of civilization would constantly be at war with each other on what seemed to be a very frequent basis (and needed PERMISSION of all things). I mean ... based on the world today, we probably would all just try to kill each other, but I'd like to believe that people would be more interested in preserving mankind and maybe figuring out what went wrong in the first place, or if there was any chance of living on the surface again ... but that might just be me. Anyway, back to the reason behind the star rating. I dove into the book with excitement and surged through the first couple of chapters, but from there I started to struggle ... and found myself reading only a few pages at a time while distracting myself with manga. I think it was part not connecting with the characters (maybe Kael just a bit. sometimes. but no one else. ), and part that I began to get the sense that the author would drop new descriptions of things, or have one little conversation between people who wouldn't talk to each other again for any extend timeframe, just to make the next plot point work. One example I remember was thinking that all the students lived in one place within the school (Hogwarts style if that helps) but towards the end he's like, nope, they totally live in condo type things on the school grounds because that's totally going to make this kidnapping easier to pull off. Even relationships between characters were just as disposable. He'd build them up all at once, and then when they finally got together, you wouldn't see them on the same page again or worse (that particular plot point still ticks me off ...). The Story: Six islands float high above the Endless Ocean, where humanity's final remnants are locked in brutal civil war. Their parents slain in battle, twins Kael and Brenna Skyborn are training to be Seraphim, elite soldiers of aerial combat who wield elements of ice, fire, stone and lightning. When the invasi Bookworm Speaks! When the invasion comes, they will take to the skies, and claim their vengeance. The Review: In the world of fiction, particularly fantasy, is rife with cliches. Frankly there are too many to blame. What is unique about the text was that there are many elements within that are quite familiar to seasoned readers. Two young adult protagonists, a magical academy, a few romances, a strange conspiracy at work behind the scenes of their world, a grand battle, all of these things have been done in countless forms and styles. It is a testament to the skills of the author that they were able to take all of these familiar elements and mold them into a story that is probably one of the most unique stories that Bookworm has read in quite sometime. The first way the story accomplishes this is in its setting. If one to firmly classify it, it would fall into the fantasy category. Indeed, on the surface, it follows many threads of fantasy. The twins grow up in a land that feels like a medieval fantasy. A farming community, raised by an aunt that is firmly apart of the working class and no technology to speak of. Not to mention that this whole world takes place on a series of floating islands and the Seraphim have elemental based powers. However, as we are taken deeper into the story, there are hints that an advanced technology is at work. This is particularly evident with the Seraphim’s wings as well as the mechanism that keeps the islands aloft. The fact that the maintainers of the current order have the world ‘tech’ in their names, ‘Theotech’ to be precise. Quite a catchy term to be honest. There are also hints that we are looking at the distant future of our current world and some great cataclysm long ago created the world the reader finds themselves in. All of human civilization is now confined to half-dozen islands. Although, these “last remnants” of humanity stories tend to push plausibility for Bookworm. Bookworm knows that is a lot coming from a fantasy story but planets are big places and frankly Bookworm would like this series, or another series with this trope, end with a ship from the outside world coming into contact with the isolated people. We will leave that to the author though. We spend a little too long in the first part of the book though. The twin’s aunt’s worry can only emphasized for so long. Then there is the setting in the latter parts of the book, the magic academy part where the twins train to become Seraphim. Again many familiar elements. The male lead starts up a romance with a young woman that is way out of his league and the female lead with a handsome, young ace. Again, all familiar territory. Amazingly, the author makes the whole thing feel rather fresh. There are also a variety of plot developments and subplots that add variety to what could veer enter well trodden territory. The best way to explain this phenomenon is perhaps the author did a good job at balancing the story and the characters. Bree and Kael are very well rounded characters. They seem to fall into a classic twin character dynamic, one is impulsive (Bree) and one is reserved (Kael) but as the story goes on, it does a good job of introducing challenge unto the characters. The never act out of character but they go through challenges that require them to reevaluate themselves and adjust their reactions. The story also helps. In spite of the characters possibly falling into the category of Young Adult, considering that age of the characters. It does not feel like a standard YA story though, it is actually quite adult and the twins find themselves in situations that are quite dark. It could be theorized that in standard YA stories, we already know that the world we are in is screwed, either by inference from the story or just told by the summary itself. Here, the revelations come more gradually. It is apparent early on, that the Theotech’s maintain and authoritarian government but it make’s sense considering the scarcity of the current civilization. As the story progresses, we start to see the corruption and outright violence that threads through this civilization and the effects it has on the twins are quite personal. Finally, there is the action. Flying is actually a something that is tragically absent from science-fiction and fantasy. Space and land battles are plentiful, but high-flying combat? Quite rare. Bookworm does not where the author did his research but wherever it was, it paid off. The battle scenes are exciting, fierce and surprisingly grounded (no pun intended) in spite of the fantasy setting. The climatic scene is a particularly white-knuckled and the reader will find themselves at the edge of their seat the whole time. No matter how gut-wrenching it can get. That only serves to make it even more compelling. Final Verdict: Skyborn spends a little time taxiing on the runway at first, it soon manages to take off and fly through albeit familiar skies but take the reader on a thrilling journey through them nonetheless. This book has been on my to-read list for a good while now. Maybe all that waiting led me to build it up too high in my mind, but most of the novel just ended up feeling…flat. An interesting concept with a large cast of characters and interesting scientific vs. religious undertones, yet I found myself skimming entire pages near the end out of sheer boredom. Bree and Kael (the twin main characters) were never fully fleshed out so that – when the various conspiracies surrounding them finally came This book has been on my to-read list for a good while now. Maybe all that waiting led me to build it up too high in my mind, but most of the novel just ended up feeling…flat. An interesting concept with a large cast of characters and interesting scientific vs. religious undertones, yet I found myself skimming entire pages near the end out of sheer boredom. Bree and Kael (the twin main characters) were never fully fleshed out so that – when the various conspiracies surrounding them finally came to fruition – instead of being excited/scared/interested, I merely shrugged and turned the page. For most of the book, this was three to three and a half stars. Then it knocked it out of the park, heading toward 4.5, near the end. However, I still have to take off that star for the slow beginning. I almost gave up on the book because of that. This book does have a YA feel, I agree, but that doesn't really affect the overall quality. I quite enjoyed it. Interesting mythology, good world building. The characters are teenagers, with all the heat and bluster of the age. A bit forced in some places, too much happening without events leading to it. Definitely only the beginning of the story, I guess much will be revealed in the next books, however some hundreds of pages of introduction is a bit much for me. This book was just okay, nothing super original or exciting, just your typical set of orphans living in a religious society that controlling and manipulating the population. Will not continue the series. I started reading this book, which I admit is quite different from many of the more Grimdark novels I've been reading lately, and I literally couldn't put it down. 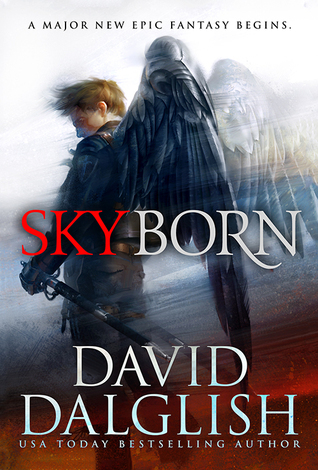 Skyborn was my first David Dalglish novel and I was very impressed by his ability to convey warmth and genuine emotion in his characters, while also creating a spectacular world that just begs to be adapted to the screen. Dalglish's intense coming of age story does not attempt to be abstract art. It is however beautifully written in bo I started reading this book, which I admit is quite different from many of the more Grimdark novels I've been reading lately, and I literally couldn't put it down. Dalglish's intense coming of age story does not attempt to be abstract art. It is however beautifully written in bold seemless prose. The character's, especially twins Bree and Kael are easy to root for, and the amazing aerial action sequences and the (not quite) magic system is excellently fleshed out and mesmerizing to visualize. I can't wait to devour the rest of this series and then read everything else this author has written! David Dalglish is one of my favourite authors, and this book simply reinforces his position on the list! As a long-time Dalglish reader, I was both excited and worried when I heard that he was writing a new series set in a completely new world. I have loved all of his other books, so he'd set the bar high for another awesome story, but I've spent so much time reading about World of Dezrel, I didn't want Skyborn to feel like a cheap copy. However, my worry was needless as Dalglish proved he can q David Dalglish is one of my favourite authors, and this book simply reinforces his position on the list! As a long-time Dalglish reader, I was both excited and worried when I heard that he was writing a new series set in a completely new world. I have loved all of his other books, so he'd set the bar high for another awesome story, but I've spent so much time reading about World of Dezrel, I didn't want Skyborn to feel like a cheap copy. However, my worry was needless as Dalglish proved he can quite successfully create an entirely new world, and make it feel completely different - and just as interesting as Dezrel. In short, I was impressed. Skyborn was unlike anything I've ever read before - "flying" countries with warriors who strap wings on their backs for aerial combat. It's a crazy concept, and I loved every minute of it. It was creative and original, and he kept me interested throughout the entire book. Some of the twists were a bit predictable, but some of them I did not see coming at all. My favourite moment is definitely a spoiler, so I won't describe it in detail, but for those who have read the Dezrel series, one of the main characters in Skyborn discovers their abilities in a similar defining moment to that which is used in the World of Dezrel. I thought that was a fantastic callback to the other world, and fit the story perfectly. I an eagerly awaiting what happens next with this character and that ability. This is a great book. Keep in mind that this is the first book in a series, and like other famed worlds, (DRoP comes to mind) everything about the world isn't revealed in the first book. It's a bit slow to start, but the concept kept me engaged throughout. The twins are likable, and they have a solid and believable relationship with each other. The love interests are, in my opinion, a bit forced (more so with Breanna's), but I usually feel that way about most love interests. There are some unexpec This is a great book. Keep in mind that this is the first book in a series, and like other famed worlds, (DRoP comes to mind) everything about the world isn't revealed in the first book. It's a bit slow to start, but the concept kept me engaged throughout. Such a good book with a unique world and plot. This first book in the Seraphim series is really about building the world and setting up the plot for the books to come. It does have a well developed plot of its own but the ending is pretty crazy and leaves you at a cliff hangar and also a good solid start for the next book.